After October ethylene contracts settled with decreases of €40/ton in Europe, PVC prices in Italy declined for a third consecutive month, but at a relatively slower pace compared to September, according to ChemOrbis. Sellers are seen limiting their discounts to half of the monomer drop at the beginning of the month. A West European PVC producer started giving October offers with decreases of €15/ton in the spot market. A producer source did not exclude the possibility of further slight downward adjustments in the upcoming days, commenting that buyers are expecting to obtain discounts of €20/ton this month. An agent of another West European producer lowered his PVC prices by €20/ton for October, reflecting half of the ethylene drop to his new prices and reported that his supply is regular. A distributor offering Central European PVC also issued decreases of €20/ton on his October prices compared to his latest September deals. “We might concede to slightly larger discounts of €30/ton later in the month as demand is rather stagnant. Buyers are not rushing to make new purchases. Meanwhile, we are still not offering k64-65 as our supplier’s plant remains offline,” he reported. A compounder received initial October offers with decreases of around €15-20/ton for different European origins and said that he is planning to accept the levels. 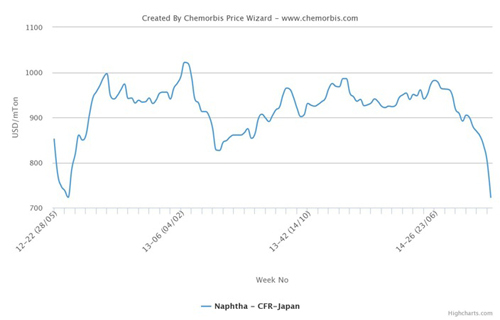 As reported on www.ChemOrbis.com, meanwhile, several other converters expressed their October buy ideas with decreases of €20-25/ton from last month, thinking that discounts slightly larger than half of the ethylene drop might be available considering sluggish demand amidst comfortable supply.